Accepta 2347 is a high-performance phosphate polymer-based treatment product scientifically formulated for use in steam boilers. 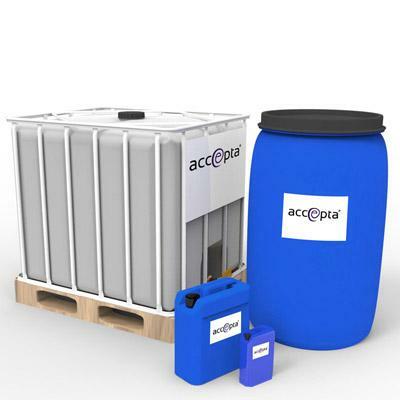 Accepta 2347 is a blended liquid treatment of polymers and is an ideal treatment for steam boilers using softened make-up water. Accepta 2347 is effective against iron and phosphate sludges. The organic polymer provides transport of the calcium, magnesium, iron, phosphate and silica through the boiler. High-performance polymer for use in steam boilers. Excellent treatment for steam boilers. Effective against iron and phosphate sludges. Reduces danger of tube overheating. Control product on phosphate reserve in accordance with BS2486 1997. Dosage (ppm) = (Feed water hardness x F) + (Feed water iron x 20). Phosphate range in accordance with the Heat Flux for boiler up to 30bar. Note: Dose Accepta 2347 proportional to the boiler feed water before the boiler feed pump. Use Accepta 2347 neat and do not mix with amines or oxygen scavengers.